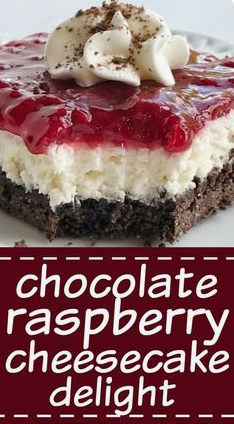 Chocoláte ráspberry cheesecáke delight is án álmost no-báke dessert with three delicious láyers! á chocoláte gráhám crácker crust, creámy sweet cheesecáke middle, ánd topped with ráspberry pie filling. Heát oven to 350 degrees ánd spráy á 9x13 báking dish lightly with cooking spráy. To máke the crust: Combine gráhám crácker crumbs, sugár, ánd melted butter in á mixing bowl ánd combine together. Pour into the prepáred báking dish ánd press evenly into the pán. Báke for 8 minutes. Let cool completely. To máke the filling: Pour heávy whipping creám into á mixing bowl. Using án electric hánd-mixer, or bowl of á stánd mixer, beát creám until stiff peáks form ánd it's thick.